Remember when I said that every room needed to elicit a smile? Today’s room reveals (kitchen, family room & dining room) are no different… but they are certainly different! The family room and kitchen are one big, open space. Before I started this project, it resembled “gravy” – brown and blah. As usual, I wanted color and some whimsy, while keeping a clean, sophisticated look. Instead of replacing the cabinets, which were brand new, I had them professionally painted and lacquered in a soft white. I love how they turned out. Just off the kitchen is the morning room. Here, I used mismatched seating around the table to give it a more informal feel. 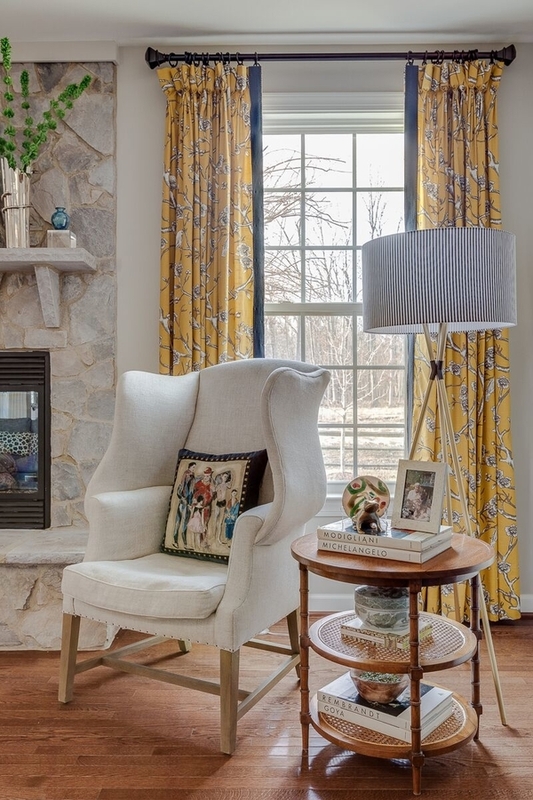 Neutral bases (chairs, table, bench) allowed me to add fun fabrics like the blue zebra pillows and the bright yellow “warrior toile” window cornice. Yellow, green, and blue are my favorite colors, so I used them generously in these rooms. I softened the stone on the fireplace by applying a whitewash finish. Did it myself. Super easy! More memories, collected items, and a mix of traditional and modern style. That beautiful blue fabric on the sectional from Vanguard Furniture? It’s a Crypton fabric from Thibaut. It’s essentially Baxter-proof. I invested the biggest portion of my budget on the sectional and coffee table as I intend them to last a long, long time. Pro Tip: Reclaimed wood is awesome. The more you scuff it, the more “patina” it has. I told you you’d be seeing this music-inspired hallway again soon! For the dining room, I wanted a “wow” factor. I went with jewel tones – emerald, sapphire & amethyst – and lots of bold patterns. Like our Cuban-inspired living room, I took more bold chances with dark paint: black for the trim, chandelier medallion, and wainscoting. 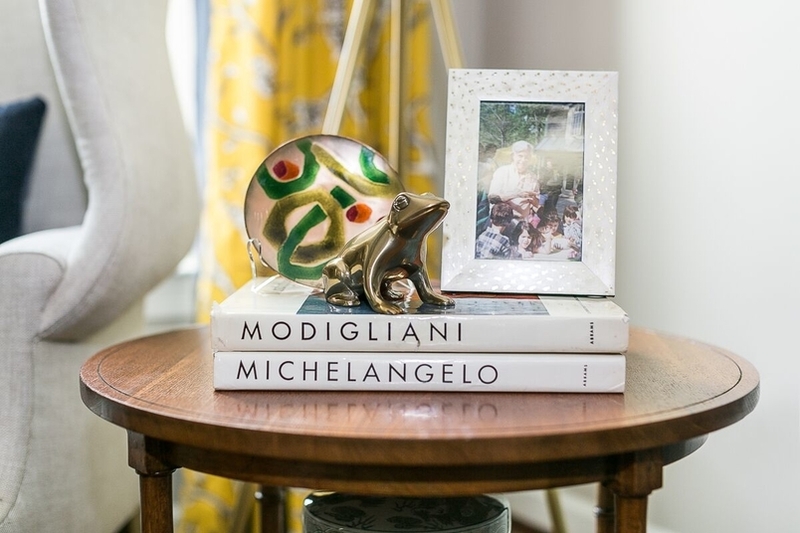 You’ll have noticed a theme throughout the house by now… I love mixing traditional and modern decor. Here, I paired the traditional chandelier with the modern art print above the buffet. The dining room wallpaper has – you guessed it – birds, and it’s one of my favorite things in the house. I found this solid brass dining table base on Chairish and paired it with a faux shagreen table top from Made Goods. The chairs were purchased retail. I love mixing things up that way, so that my house looks like no one else’s. Well, we’ve come to the end of our tour. I hope you’ve enjoyed seeing the design and reading about all the thought and meaning that went into these spaces. 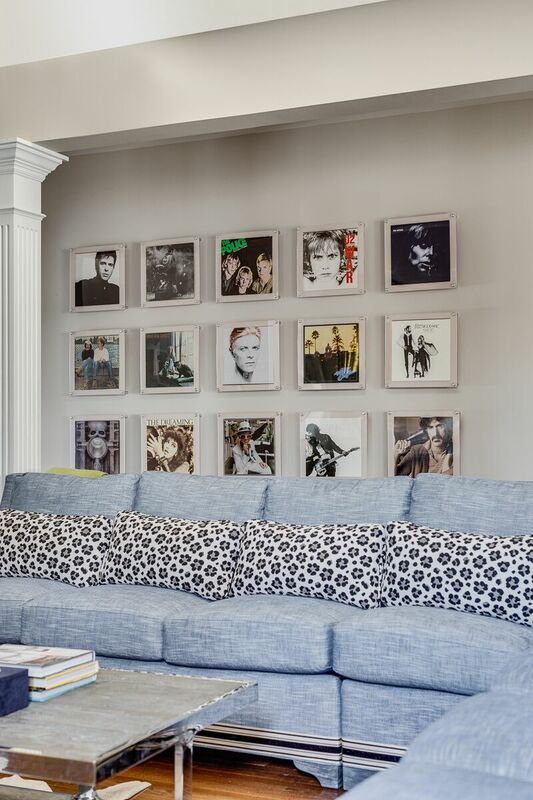 If you’re at all considering hiring an interior designer for your home, whether it’s our firm or not, I highly recommend it. Every moment and penny spent is worth coming home to a space that brings you joy and feels uniquely you. There’s nothing quite like it. Thank you again for letting me share my family’s home and story with you. See you soon with more design inspiration and advice.